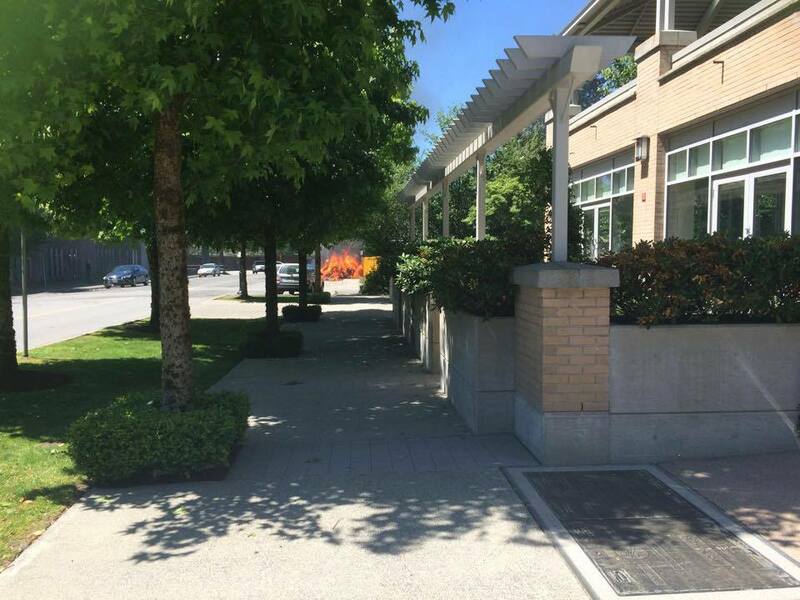 The back end of a garbage truck burst into flames outside a seniors’ home in West Vancouver early Friday afternoon. Deborah Burrowes, who works for Amica’s West Vancouver community, told Vancity Buzz the incident occurred at approximately 12:45 p.m. when the Smithrite Disposal truck was driving on Clyde Avenue. Residents inside the building saw the truck’s load catch fire and the driver perform an emergency maneuver to ensure the fire would not put other people and property in harm’s way. “He was just around our building at the time, and we watched him calmly make a tight three point turn, with flames billowing out of his truck, turn around, drive half a block away to dump his burning load in front of a vacant lot half a block away instead of in front of our building and other residential occupants,” said Burrowes. Despite carrying a burning load, the driver remained in the truck and unloaded his contents a safe distance away from other property. Firefighters arrived at the scene quickly and extinguished the blaze. West Vancouver Fire & Rescue and Smithrite Disposal could not be immediately reached for comment.